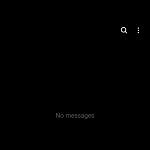 For the past few weeks, I have used the One UI beta on my Samsung Galaxy Note 9. There’s a lot to say about the new direction Samsung is taking with their software, but I think it’s important to start with an introduction to Samsung’s custom Android software experience over the years. Samsung’s early software iterations was called TouchWiz, and it had a poor reputation among Android enthusiasts for being slow and bloated. Samsung Experience made considerable improvements over TouchWiz with a clean and fast UI and more than enough features to satisfy everyone. One UI is the name for Samsung’s latest software layered on top of Android Pie, and it focuses on two areas of improvement: A redesign to make it optimized for taller phone screens and darker interface colors with a new night mode. An official beta release is available for the Galaxy S9, Galaxy S9+, and Galaxy Note 9, and here’s our initial review of Samsung’s latest software release. 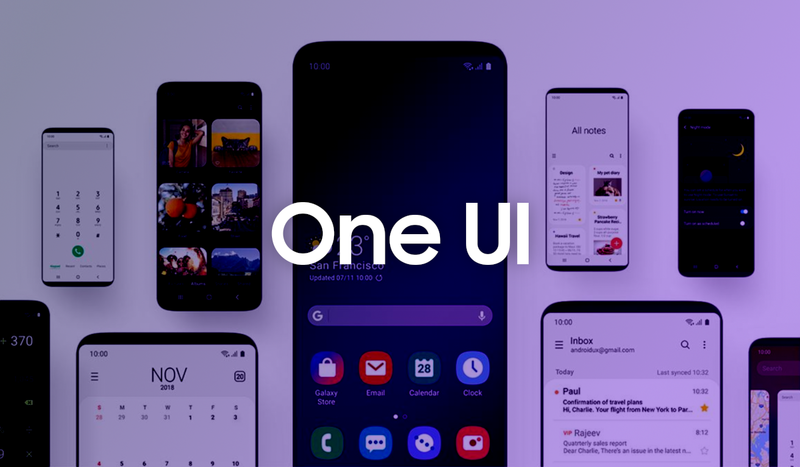 Here you can also watch our video review of One UI on the Samsung Galaxy S9 by Daniel Marchena over on XDA TV. Samsung’s method of solving the issue of displays getting ever taller is to shift the entire interactable UI down towards the bottom. They rethought the way their apps were designed by dividing apps’ UI into the information area and the interactive area. The top third of the UI is the information area, while the bottom two-thirds of the device is the interactive area. When our readers first saw the design changes in One UI, many felt that Samsung was wasting a lot of space up top. I agreed with this at first, but as I used the latest update more and more, I realized I was totally wrong. One UI makes the experience of using a tall phone like the Galaxy Note 9 much easier. I love large phones. The smallest screen I have used in the last year was 6.2-inches in diagonal. On all these larger phones I needed to shift my hand around to use them. I even sometimes have to switch hands to make it more convenient. Now, all of the stock Samsung apps in Android Pie really helped with this. The quick settings are moved down to make it easier with one hand. Message threads are moved down. Everything in the stock apps is moved down. I quickly realized I wasn’t shifting my hands around the screen and it felt as if I could use my phone for longer without getting usage fatigue. Let’s look at specifically the Clock app. 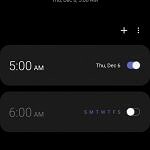 At the top, on Samsung Experience 9.5, it shows the different clock tabs, with the alarms listed underneath. In One UI, the tabs have been moved to the bottom of the screen. These are the interactive parts. Instead of listing the alarms from the top of the screen, they are placed in the middle, where it’s easy to reach with one hand. The top part that says “All alarms are off” is the informative part. We can see the same thing in Messages. Samsung Experience 9.5 has the tabs at the top. One UI moves the tabs to the bottom and makes the search button a little icon above the threads. Those two apps are perfect examples of One UI’s focus on one-handed usability. It shifts everything down to the interactive area. This is great for the future of tall and large displays. The one quark about their redesign is it doesn’t always shift down by default. This doesn’t mean there is a setting to toggle but some apps, like My Files, requires you to swipe down to make it easier to reach. This could be a bug with the beta or part of the official update, but it’s there and noticeable. While Google has slowly been adopting a bottom tab approach in their most recent app redesigns following the Google Material Theme principles, most apps are still hard to use with one hand. Samsung redesigned their software to not only match the latest design trends, but also to match their own hardware. Tall displays will be around for the foreseeable future, so why not truly embrace it in the software? 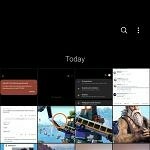 Below are some screenshots showing off One UI versus Samsung Experience 9.5 running on the Galaxy Note 9. As you can see, most apps have everything shifted down. The launcher is basically the same, but when you go to Bixby Home, it has the big empty area at the top. The only apps that are close enough to say didn’t change are the launcher, lock screen, calendar, and My Files. The lock screen is interesting because Samsung defaults the clock to the top of the display. On earlier builds of One UI, it was at the bottom, so this could be a bug. If it isn’t, Samsung unnecessarily moved the clock to the top. The best place to start comparing One UI to Samsung Experience 9.5 is the worst part of Samsung’s software: Bixby. More specifically, Bixby Home. The One UI Bixby Home is almost all black and that’s the first and most noticeable change. While looking a bit deeper at the changes, Samsung shifted everything down. The first thing that is shifted down is the greeting text. It says something like “Hello Maxwell” in the top third of the screen, while on Samsung Experience 9.5 it says it in the top left corner. Next is Calendar. The two apps in the different software versions are basically the same. The difference between the two apps is the curved corners. This can be found in almost all UI elements in One UI. Samsung does shift the current month to the middle of the screen and the settings for the calendar are also moved over to a side panel. This doesn’t take advantage of the new interactive and informative parts of the display. The camera in One UI doesn’t get any new features or modes like one might expect with a new Android version. Samsung moved the modes to the bottom of the screen, which, once again, shifts the interactive parts of the display. It also moves the zoom icon to the bottom center with an easy to access control button. The controls for the timer, flash, and filters are moved to the top informative section, right under the options for Bixby Vision and AR Emojis. These were moved up here because they are used the least of all the settings. In the screenshot below, Scene Optimizer is shown to be a new camera mode. In a later beta, it was changed to a little icon in the bottom right corner that you select when you want it enabled or disabled. On Samsung Experience 9.5, you needed to go to camera settings to disable Scene Optimizer. This is a great use of the new interactive section of the UI. The launcher didn’t change much in One UI. To be completely honest I didn’t notice any new features or design changes. The only minor change that I could see is the search bar. While going to the app drawer the search bar looks slightly different compared to Samsung Experience 9.5. 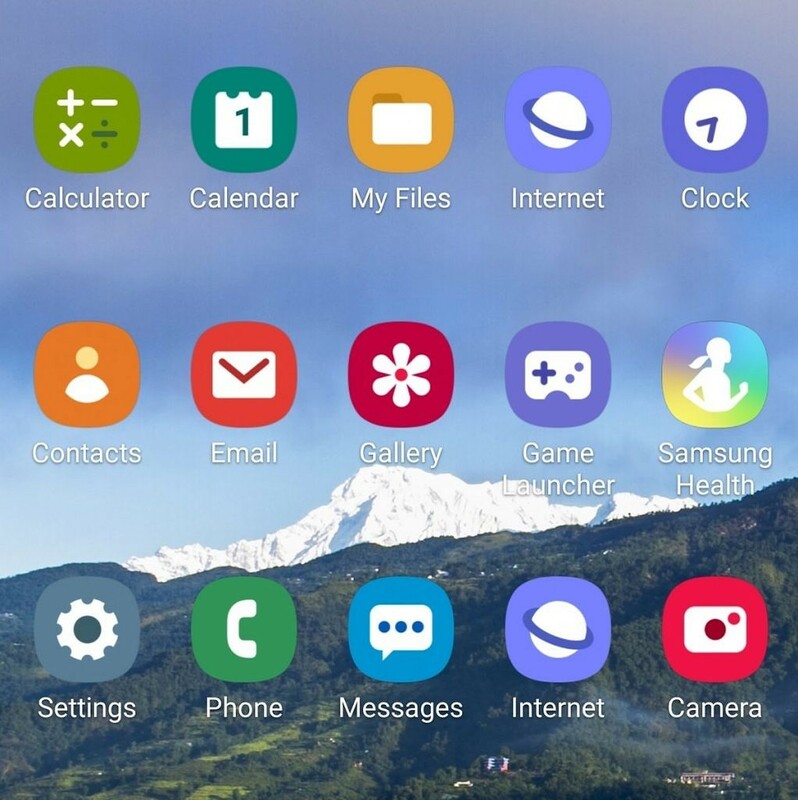 Every stock Samsung app got a redesigned icon, which I’ll show later. The weather app and icon did change a bit, but that’s not a huge deal. These have no updates for the interactive and informational parts of the display. The SystemUI and lock screen are generally the most important parts of an Android UI to people. While looking at just notifications, it looks like Android Oreo and pretty much any other version of Android. Expanding the quick settings is where things get interesting. It has a 3×4 grid with all the quick settings toggles. This shifts it to the interactive section. Unlike Google, Samsung didn’t remove the quick access to settings, so you can quickly change WiFi networks without going into the Settings app. It shows the date and time at the top third of the display. Right in-between the time and date and quick settings are the new search button, settings icon, and settings for the quick settings panel. This just lets you rearrange the button order and grid size. The lock screen is the same old lock screen that you might have seen on Samsung Experience 9.5. The Always on Display and clock screen both got new clock faces which makes the phone more customizable to how the user likes it. The recents menu also got an Android Pie style update. All apps now show in a horizontally formatted card carousel. At the bottom, you will see a couple of your recently used or most used apps (I couldn’t figure out which ones it was showing.) At the top, it will show a search bar. 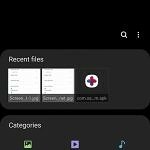 Samsung seems to be pushing its Finder app because that search bar is appearing more and more. Messages got a nice update with One UI. It moved access to thread and contacts down to the interactive area. As a test, my friends and I decided to use RCS messages. While I didn’t get any screenshots of it, we were able to use RCS messages. My friends were both running T-Mobile Galaxy S9+’s on their official One UI beta while I was running the un-official beta on a T-Mobile Galaxy Note 9. We were able to see read receipts, change the name of the chat, view who is typing, and even send large files. Samsung and Google did announce that Android Messages RCS would work on One UI, but T-Mobile is using a proprietary service for their RCS so it didn’t work. 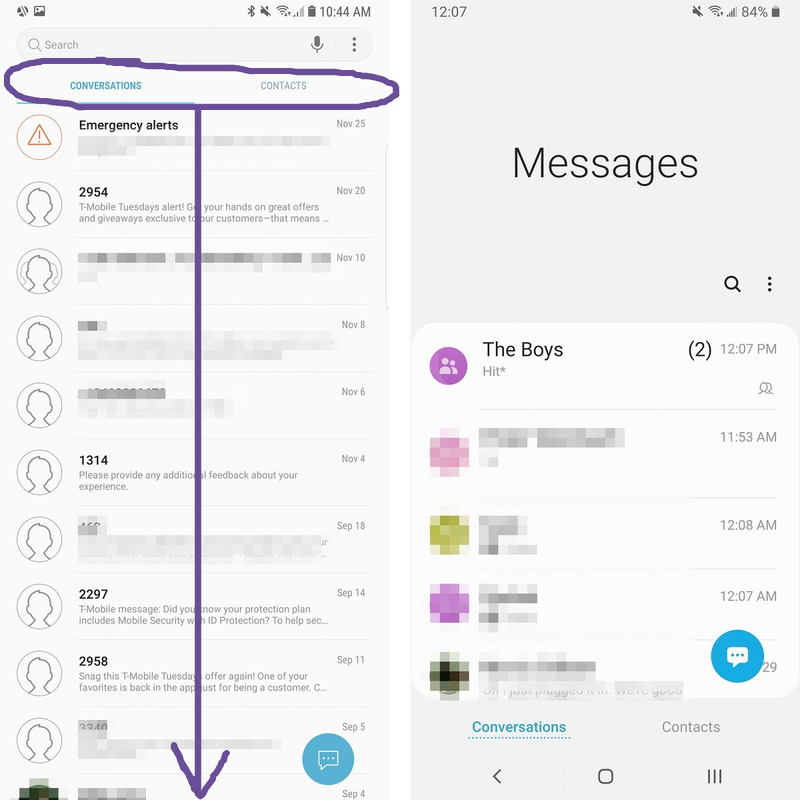 Contacts got the same style update as Messages by bringing everything to the bottom interactive area of the display. It moved the app name, and in the case of contacts, my contact name and profile pic to the top in the informative section. Clock, Files, and Notes each got their new UI as well, shifting usable UI elements down. The Notes app moved them over to a side panel from a drop down where it was in Samsung Experience 9.5. Files is pretty much unchanged besides its curved corners. Clock got an interesting update. 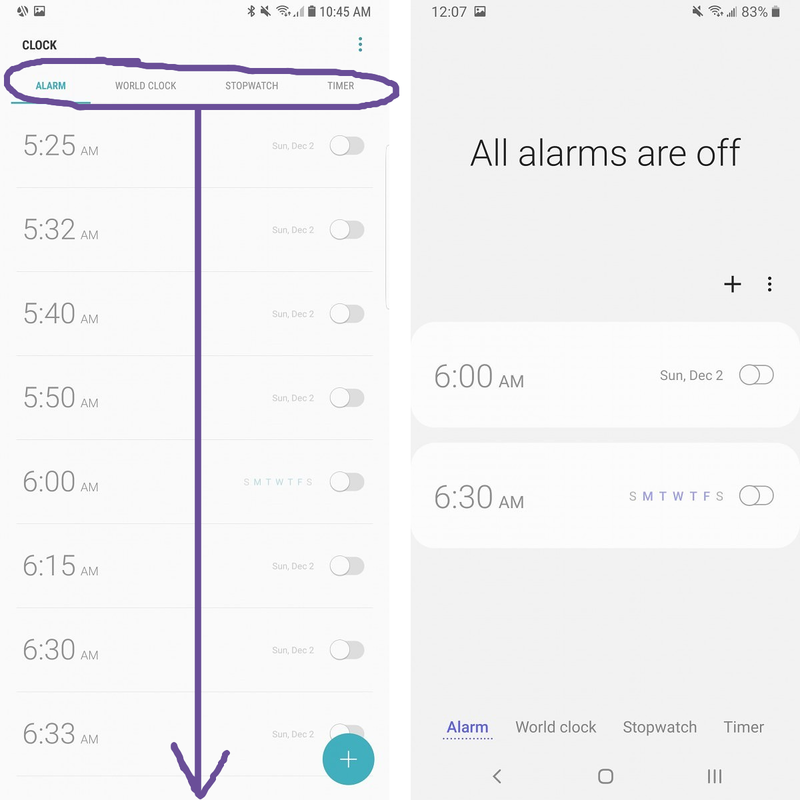 It shifted everything down to the interactive area, as every other app did, but in the alarm section it writes out the time until your next alarm. This is where the term “informative” comes into play. On Samsung Experience 9.5 it would just use that space to list out each alarm. There are a few things I am not a fan of in this update. I just don’t like the new icons; they seem cartoonish and young. Maybe it’s to try to get a new fan base of younger users (after all they are pushing Fortnite hard for the Galaxy Note 9), or maybe it’s just to spice things up. Whatever the reason, they just don’t match the aesthetic and idea of a professional device. There are parts of the UI that are changed to Samsung’s new One UI font. Most of these are the informative bits at the top. One UI isn’t as jam-packed with new features as you might expect. It sprinkles them here and there where it can be useful. Let’s take the S Pen on the Galaxy Note 9, for example. There is one new feature that allows you to make the writing on the Always on Display white instead of the color of the pen itself. 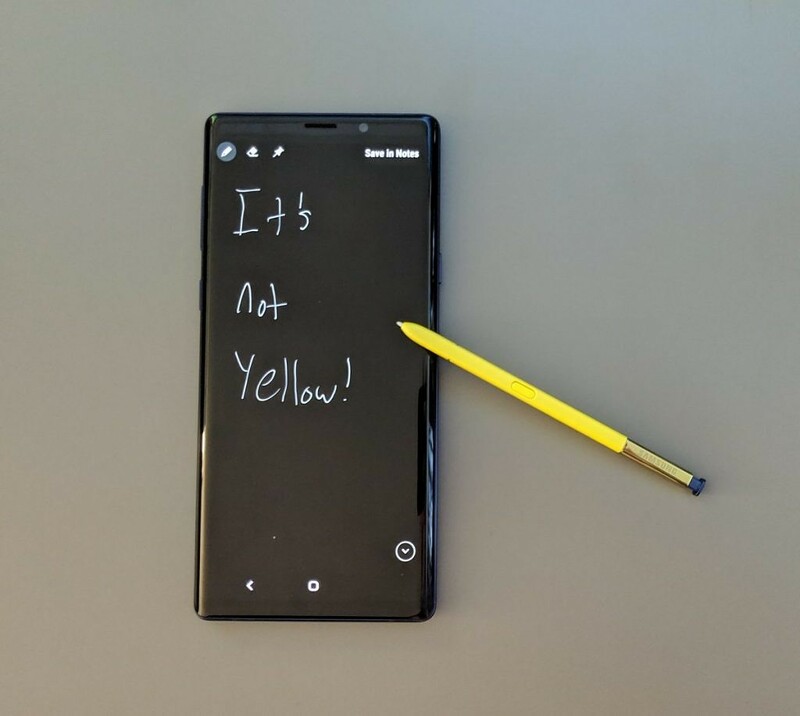 Sure, I like seeing the vibrant yellow when I quickly pull out my phone to take a note, but white just looks more professional and its easier to see. My favorite new feature is actually lift-to-wake. This has been in a few phones in the past, specifically the iPhone’s starting with the iPhone 6S. You just pick up your phone and the display turns on. This might seem like something useless or a waste of battery, but it comes in handy. If you use intelligent scan and raise to wake, the phone almost instantly unlocks when you pick it up. This is a nice refinement on top of the already great UI update. Lift-to-wake is technically a gesture so let’s talk about the new gesture navigation. It’s very simple. All you do is swipe up from the bottom of the screen where the button on the navigation bar used to be. I didn’t use the gestures at all during my time of One UI. There is no way to get over the fact that you can’t use Google Assistant with these gestures. I refuse to use Bixby and I choose not to install Bixby button remapping apps. Our Navigation Gestures app already has a feature that allows for this, but it’s built into the phone now. There are also some other features thrown in there that are pretty nice. The scene optimizer in the camera is its own separate camera mode now so you only get the colors boosted to a terrible amount if you want them to be. Please note that in a later release of One UI, Samsung turned scene optimizer into a button in the bottom right corner of the frame. I am not reviewing that version, so it is not included here. There is an animation reducer that makes animations fast and smooth enough that it makes me think I am using a OnePlus 6T. They aren’t anything major, but nice little ones. Another new feature many people will love is the system-wide dark theme. In almost every stock app it will turn all the white to black or gray. The all-white design of most modern operating systems can be rough on people’s eyes. It also drains the battery a bit more than black on OLED displays. Since Samsung’s phones pretty much always have OLED screens, making it black will not emit any light, thus saving battery. Samsung’s dark mode goes great with their one-handed design too. Below you can see six stock Samsung apps with the dark mode enabled and screen shifted for one handedness. Themes and customizing the phone is where Samsung has excelled in the past. Samsung has had its own theme store for a long time, allowing for custom themes, icons, Always on Display designs, and wallpapers. Recently, with the launch of One UI, they said free themes could only be used for two weeks at a time. This is terrible, but luckily, apps like Substratum and Swift Installer still work. Even without the theme store, we can get the themes we know and love from the lovely developers that make them. The conclusion to be made about One UI isn’t a simple one. It’s more of an acceptance of the future. Whether you like or dislike the new design Samsung is going for, you have to at least appreciate there is a reason for it. Samsung is preparing for the future filled with tall phones. They won’t go back to their old 16:9 aspect ratio any time soon. Taller 2:1 or 18.5:9 aspect ratios are working. Customers don’t dislike them and they feel modern and futuristic. Samsung is the first company to show that they know where the future is heading and they are designing their software around this future. Whether you like it or not, this is just the beginning. I am excited to see what Samsung does with this in their upcoming folding phone and even their phones in the next two or three years. They are just getting started. If you want to try One UI for yourself, you can install it on the Samsung Galaxy S9, Galaxy S9+, and Galaxy Note 9. The Galaxy Note 9 builds are only for the U.S. Snapdragon 845 (SM-N960U) model. 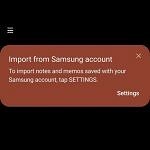 The Korean (SM-N960N) and U.S. Unlocked (SM-N960U1) Galaxy Note 9 devices have already had their One UI beta start. Both the Snapdragon and Exynos Galaxy S9 and Galaxy S9+ have official One UI betas, depending on what country you’re in. If you don’t feel comfortable with these methods, you can wait for a little over a month for the official release.